Tropical Storm Sandy -- downgraded from hurricane status -- was expected to make landfall early Tuesday near the Delaware coast, then hit two winter weather systems as it moves inland, creating a hybrid monster storm that could bring nearly a foot of rain, high winds and up to 2 feet of snow. Experts said the storm could be wider and stronger than Irene, which caused more than $15 billion in damage, and could rival the worst East Coast storm on record: the Long Island Express, a 1938 New England hurricane that killed nearly 800 people. "Be forewarned," said Connecticut Gov. Dannel P. Malloy. "Assume that you will be in the midst of flooding conditions, the likes of which you may not have seen at any of the major storms that have occurred over the last 30 years." Sandy, which the National Weather Service was calling a "very large tropical cyclone" early Saturday, killed more than 40 people in the Caribbean, where it wrecked homes and knocked down trees and power lines. "It's going to be a long-lasting event, two to three days of impact for a lot of people," said James Franklin. "Wind damage, widespread power outages, heavy rainfall, inland flooding and somebody is going to get a significant surge event." With so much seemingly on the line, DailyFinance has put together a suite of articles on responding to a storm like Sandy, from preparation to the aftermath. 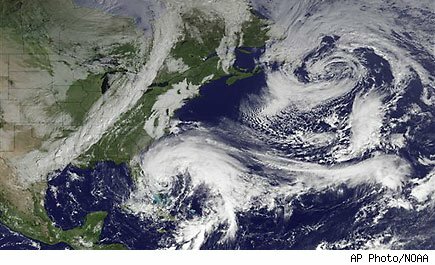 Sandy the Frankenstorm Is Coming: Do You Have Flood Insurance?